People love their pets. That’s just a fact. Did you know that approximately 68% of households now report they have some sort of pet in their home? That’s right: 68 percent of households have a pet. Now, it’s possible that many of those households have things like birds, turtles, fish or other animals that don’t travel well. However, it’s also safe to assume that a good number of them have travel-friendly pets, such as dogs (or cats, in some cases). A good percentage of that pet-owning group is also likely to travel at least once a year and they’re going to need to find a place to take Fido. Boarding pets is pretty expensive and, like we said, people love their critters and don’t always enjoy being separated from them. Here’s what we’re getting at: As a vacation rental host, it might behoove you to list your place as pet-friendly. Here are 5 reasons why you should be renting to guests traveling with animals. 1. Everyone else isn’t doing it. We’ve discussed time and time again how difficult it has become to appear unique in a sea of vacation rental listings. As the industry continues to gain more and more traction among travelers, it’s even harder to do things to set yourself apart. That being said, far fewer vacation rentals are listed as being pet-friendly. This gives you an immediate jump up the list of available rentals for a very specific niche. Pet owners are always looking for friendly and accepting places to bring their furry kids and – just like parents of human children – they talk. This could be a great opportunity for you to score some referrals, too. 2. You have another hosting edge. You’ve probably gone out of your way to prepare some kind of welcome packet or helpful notes for your guests. This might include suggestions on where to eat around the neighborhood, fun places to visit, or general information that will be helpful during their stay as well as instructions for checking out. If you’re hosting guests with pets, you have another benefit to highlight: Places they can go and bring their four-legged friends along. If there are local hangouts that are also pet-friendly, make a point to mention them in a special section of your welcome packet. List nearby dog parks, pet-friendly restaurants or cafes, as well as any specific instructions you have for animals staying in your home. 3. You can make more money. Pet owners aren’t scared off by higher-than-usual deposits or non-refundable pet fees. In fact, they’re usually pretty used to it. Not every pet owner is responsible and manages their animal well; sadly, everyone else must pay the price for their poor travel conduct. By charging higher rent to serve as “pet rent” or by including additional cleaning fees, you have an opportunity to make more money than you would from pet-free guests. Here’s something to note, though: Some experts suggest that you’re better off charging higher rent than to charge deposits. Many guests will be turned off by the thought of non-refundable deposits but won’t think twice about paying a higher rent amount to accommodate their animal. Industry leaders and organizations like the Foundation for Interdisciplinary Research and Education Promoting Animal Welfare (FIREPAW) state that pet-friendly rentals can charge anywhere from 20-30% more in rent over the amount offered to non-pet owners. That adds up pretty quickly. 4. You still have control. There’s plenty of reasons why you might want to list your vacation rental with an “instant book” option but, as you know, this removes a number of factors from your control. However, if you individually approve all guests and reserve the right to decline prospects based on the size, age or breed of their pet, you still remain in the driver’s seat. 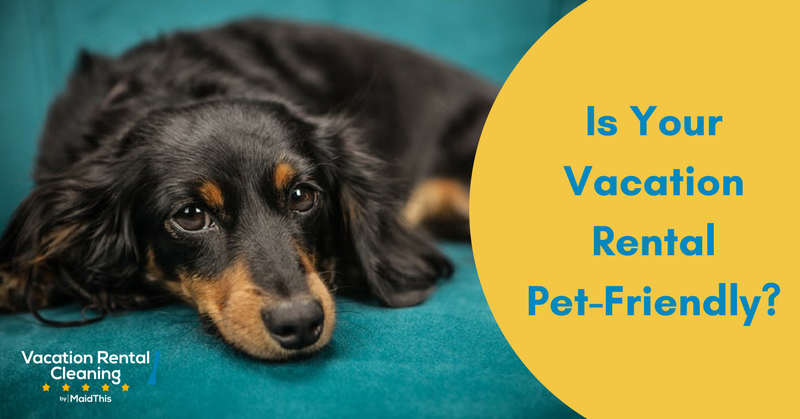 If you need help getting started with what you’ll allow in your home, the team at HomeAway has put together an awesome resource for deciding what parameters to put into place as you prepare to rent to pet owners. 5. You’re not likely to incur any more damage than usual. Now, this is definitely not always the case, but generally speaking, folks who travel with their pets tend to have a better handle on their animal’s behavior. Keep in mind that your guests aren’t going to be living long-term in your vacation rental and therefore, there’s not much time for their pet to destroy your place. What’s more is that pets aren’t human children. Young kids are hard enough to manage and arguably, they’re more challenging to keep tabs on than animals. Remember that control we just talked about? It can come into play here, too. If you say “no” to puppies and kittens, you’re less likely to incur physical damage to your place. What it really boils down to is this: Pets may have accidents if they don’t make it outside fast enough but they’re not likely to draw all over your walls or furniture with things they find in a drawer or in mom’s purse. It’s something to think about! There’s more than one way to improve your occupancy rate and ensure you’re booked year-round. Though there are always a few risks involved, the payoff is definitely worth it. By catering to guests who have pets, you’ll be giving yourself more opportunities to stay busy, make more money, and potentially gain additional referrals. Interested in learning more about vacation rental turnover cleanings? Take a look at how MaidThis! helps hosts prepare for their guests.